Yahoo sees a big future in television, and TV manufacturers are responding. The Sunnyvale Web portal came with the intent of showing off its Yahoo Widget Channel and so far, some of the biggest TV-makers are playing ball. Samsung, Toshiba and LG announced they will install the software on select TVs. The channel delivers Yahoo's basic service of news, information and entertainment. The widgets will also incorporate third-party content. Cisco is touting its work in Eos, a new platform for media companies that want to build better Web sites around their content. The initiative is a little different for Cisco in that it involves a team of software guys in San Francisco trying to help big companies like music labels, broadcasters and sports leagues better leverage their stuff and build stronger user communities around their content. Big media companies have a lot of content. But when it comes time to build a site for, say, a television show, they often stitch it together using different technologies. Cisco believes that by building one platform for media companies, it can make it much easier for them to cheaply and easily build and maintain these sites. They can be more dynamic, have more social networking features and better use the company's library of content, which is often separated into silos. It's another example of Cisco moving beyond its networking roots into areas where consumers interact. Along those lines, Cisco is coming out with a Linksys Wireless Home Audio System, the company's most consumer-oriented product to date. The mix-and-match system allows a user to beam music around the house, so multiple rooms can enjoy the same song over Wi-Fi. The product puts Cisco up against a similar setup from Sonos. Toshiba has ambitious plans for the future of TVs. It talked up its new Regza TVs, which are pushing the envelope on picture quality, features and design. And it unveiled a Cell TV set-top box that features a muscular cell processor that helps the box serve as a HD server, record six HD channels simultaneously, handle 4Kx2K resolution and super fast up-converting of SD pictures to HD and HD to 4Kx2K, the next step up in high definition. Toshiba is pushing hard to differentiate its 2009 premium Regza line of LCD TVs both from its non-Regza displays and the competition. The top-end TVs feature USB ports, SD card slots and new screen constructions that add the feeling of more depth. Toshiba also announced that Dolby Volume will go into its latest Regza ZV650 and ZV670 series televisions due out in April. The technology can negate the big jump or drop off in sound as you move from channel to channel. It can also maintain the sound level during a movie, allowing you to hear the whispers in one scene without getting blown over by explosions in the next. The sound quality doesn't get chopped up or compressed. The technology mimics the way your ear listens and maintains the trebles and bass dynamically in a limited range. For stargazers who would love to know what you're looking at but don't have the time or patience to figure it out, Meade Instruments has a telescope for you. The Meade ETX-LS is a dead simple automatic telescope that uses GPS, a magnetic sensor and a leveling sensor to orient itself. There are other telescopes that offer some automation but the ETX-LS tries to be the easiest for newbies to use. The ETX-LS goes on sale this month for $1,299. Adrenaline Technologies has created a microSD slot in its stereo Bluetooth headphones. In fact, it has the patent on the idea, and is looking to license it to others. With so much music able to be transported on a tiny microSD card, it makes sense to build support for the cards right into a headset. You can plug in your own mix of songs on the cards, which have 16GB of space, or you can buy some of SanDisk's new Slotmusic cards, which come preloaded with full albums. Either way, you have the music right on the headset, instead of relying on another device to supply it. The headphones will go on sale in the second quarter of this year for $129.99. Want to power up gadgets without plugging them in? Powermat works through magnetic induction, rather than conduction. It provides efficient charging equal to wires but also the possibility of wireless transmission of data, such as audio and video. 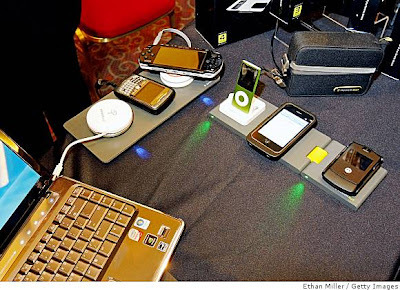 Powermat also uses RFID radio technology to identify the device that is being charged. The device comes with five different mats that connect with up to six receivers at a time. So far you can get receivers for phones like the iPhone, most BlackBerry handsets and the Motorola RAZR. There are also dongles for the PlayStation Portable and for some laptops. The idea is to get this technology embedded in devices, homes, offices and hotels. The Powermat will go on sale in the fall with a starting price of $99.99 for the mats and $29.99 for the receivers.